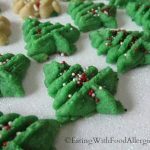 Spritz cookies are one of my family’s favorite Christmas cookie traditions but really, we make them year round because they’re so good! We have fun with food coloring and making them fit the theme of whatever holiday is coming up. Cookie presses has several shapes that can be used. We make trees and stars at Christmas, hearts for Valentine’s day, and even clovers for St. Patrick’s Day! For a “fancy” cookie, try this: Divide the dough in half. Add a food coloring color of your choice to one half and leave the other half white. Add one color of dough to one side of the cookie press then add the other color to the other side. Press the cookies onto the cookie sheet and you will get a “half and half” cookie. My son loves these! 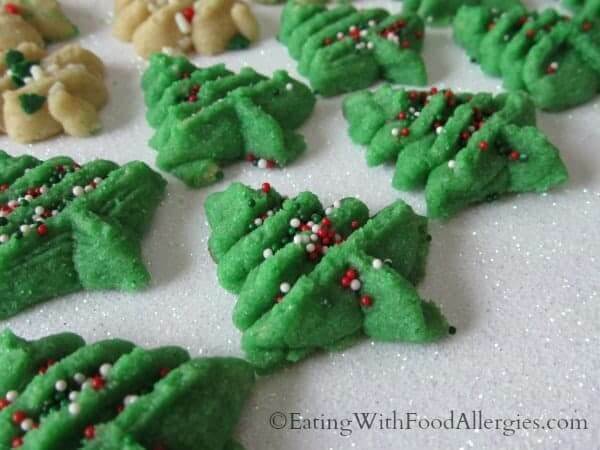 Spritz cookies are a "buttery" cookie that can be made for any occasion. These are free of dairy, egg, soy, wheat/gluten, peanuts, and tree nuts. Beat butter or margarine and sugar together until creamy. Add egg replacer and vanilla; mix until combined well. Mix flour and salt in separate bowl. Add to batter mixture and mix until combined. Put dough into cookie press and press onto ungreased baking sheets. Bake for 6-9 minutes until set but not brown. Remove cookies from baking sheets immediately.